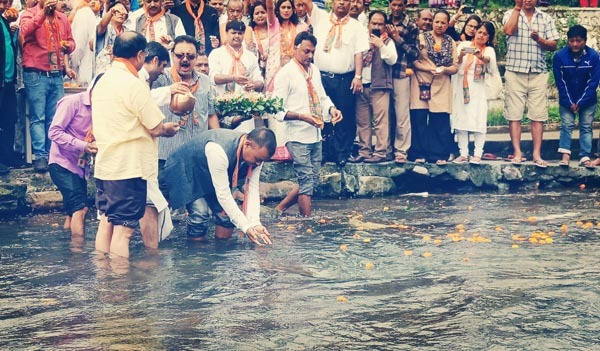 The ashes of former Prime Minister late Atal Bihari Vajpayee were immersed in the Umshyrpi river in Shillong on Saturday. Before the immersion ceremony, the urn containing the ashes of Vajpayee was taken in a vehicle from the BJP office at Oakland here with BJP leaders including national spokesperson, Nalin S. Kohli, BJP MLA and health minister, AL Hek and other state party leaders and functionaries marching in a procession till Umshyrpi river. On reaching the bank of Umshyrpi river, BJP Meghalaya unit president, Shibun Lyngdoh took the urn and led the immersion of the ashes. Lyngdoh immersed the ashes thrice into the water along with other leaders. The urn containing the ashes of the former Prime Minister reached Shillong on Thursday and it was kept at the BJP office. On Friday evening, a prayer meeting attended by religious leaders from various faiths was organized by the BJP. Leaders of some political parties also came to pay their tribute to Vajpayee.